An Post has won two awards in the Allianz Business to Arts Awards thanks to its commitment and openness to artistic thinking when marking the 1916 centenary. Holding a place of symbolic importance for Irish people as the headquarters of the men and women who took part in the Easter Rising of April 1916, the GPO in Dublin’s O’Connell Street is at the heart of An Post’s success at the Allianz Business to Arts Awards in this special centenary year. An Post has won the Judge’s Special Recognition Award for Portfolio of Investment for its new visitor experience GPO Witness History along with its partnerships with Carlow Arts Festival, Stoney Road Press, Fishamble: The New Play Company, the Philatelic Advisory Commitee (PAC), artist Barbara Knezevic, Dublin Dance Festival and Stormy Petrel. The latter three partnerships also earned An Post the Jim McNaughton Perpetual Award for Best Commissioning Practice in the Allianz Business to Arts Awards for Knezevic’s memorial piece ‘They are of us all’, ‘Embodied’ by Dublin Dance Festival and ‘Stormy Petrel/Guairdeall’, which was a collaboration by artists Orla Ryan, Alanna O’Kelly and Brian Hand. Completed in 1818, the GPO is the oldest purpose-built still functioning general post office in the world and O’Connell Street has always been a place of protest, pageant and parade with the GPO as the focal point. With this in mind, An Post decided to embark on a number of arts-related projects to sensitively acknowledge and honour the events of 1916 and reflect the GPO’s role in the history of the State. “We have been involved in the arts for many years through our annual stamp programme which incorporates a whole raft of interaction with artists and designers in conjunction with the PAC,” says Barney Whelan, director of communications and corporate affairs at An Post. 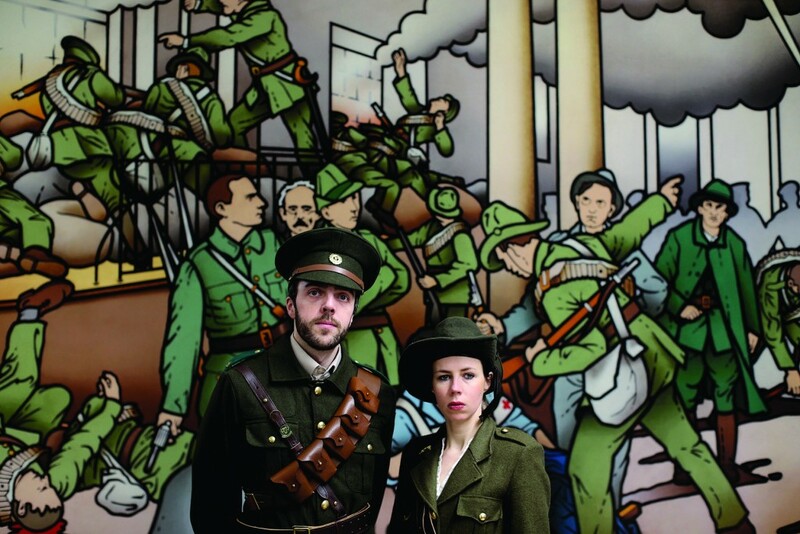 GPO Witness History is the centrepiece of An Post’s artistic investment in the centenary. This new interactive and immersive visitor experience for Dublin, created by An Post with State support, tells the story of the 1916 Easter Rising and its aftermath. Since it opened to the public on 29 March 2016, the exhibition has welcomed over 78,000 visitors. “By 2012, we were hearing lots of ideas floating around both in the media and at State level about what should be done with the GPO in 2016. We were alarmed that none of them included An Post,” says Whelan. “In an effort to ensure we didn’t lose our headquarters and central office to something ill-advised or overtly political, we developed a landmark proposal ourselves for a visitor experience that would deliver on a number of cultural, historical and business objectives. To coincide with the museum’s opening, An Post put together an open call for public art based on the Proclamation of the Republic and its relevance to Ireland and received over 80 proposals. with An Post finally chose the proposals from Dublin Dance Festival and Stormy Petrel. Having supported broadcaster Joe Duffy with his research in relation to the children killed in Easter week 1916 for the past couple of years, An Post felt it would like to do something in that regard as there was no other monument or place to mark these 40 children’s deaths. Knezevic was chosen from five proposals to create this work as part of a closed call process managed by the curators. ‘They are of us all’ is in the newly created courtyard area as part of the new GPO Witness History visitor centre. The ground-level piece has been created using a base of polished steel, on which each child is represented by a piece of black limestone salvaged from the ruined foundations of Jacob’s Biscuit Factory, which was a key rebel-held site during the Rising. “The interesting thing for me as a public art commissioner was how we moved from purely permanent pieces to a more fluid statement with the performance pieces,” says Whelan. Collaborating with the performance artists was a new departure for An Post, which required a considerable practical effort as the shows needed to happen in the context of a functioning place of work and business. “We worked with Dublin Dance Festival for several months as they had to gain access to the GPO and get to know the feel of the space and its limitations. There were six different solo performances with six different lighting and audio gigs, which had to be stripped out the next day so the GPO could open. Half of the area was a building site during the rehearsals and preparations,” says Whelan. Carina McGrail, general manager of Dublin Dance Festival, says the main reason Embodied worked was because Whelan and his team were so invested in it. “We took the audience on a moving trail of six proclamation-themed pieces by six female choreographers through the GPO and ending up in the courtyard. While An Post was originally only looking for one piece of public art as part of its open call, it decided to also run with the Stormy Petrel/Guairdeall proposal in addition to Embodied as it was so unusual, according to Whelan. This sound installation in the GPO Witness History courtyard is based on World War 1 listening devices and was combined with a performance piece during the centenary commemorations. “Our collaboration begins with the symbolism of the stormy petrel, the world’s smallest seabird, as a metaphor for someone who is an avatar of change and whose appearance announces an oncoming storm,” says Ryan. An Post made brave decisions around commissioning for the centenary, believes Knezevic, whose idea for ‘They are of us all’ came to her almost immediately once she received the phone call from O’Connor asking her to propose something. “With any public artwork there is pressure to make something traditional in the sense of being a monument. An Post went with really contemporary works as well as non-monumental pieces. I noticed that all the staff really came on board with that and everyone grew in the process. Outside of the commissioning process, An Post collaborated with Stoney Road Press and Poetry Ireland to publish ‘16’, a limited edition, fine-press collection of poetry and art and with Fishamble: The New Play Company to produce ‘Inside the GPO’ by Colin Murphy in the main hall of the GPO itself. Meanwhile, its partnership with Carlow Arts Festival involved giving a local post office a facelift with 12 portraits of local people being fitted on the front which helped to align the post office with the ethos of the festival.